What comes first, the chicken or the egg? I have been asked how I create recipes for Z is for zest. Not an easy question to answer. When I start thinking about recipes for the site, sometimes I daydream about creating a delectable dish and other times I envision the photo shoot. Each aspect is equally exciting to me. This week I volunteered at the Seven Springs CSA Farm. I witnessed the farmers returning from the fields where they had plucked lettuce, scallions, bok choy, radishes and mixed baby greens right from the ground. The volunteers, including myself were responsible for cleaning these items, bagging and delivering all the bags to a co-op here in Roanoke. There is something to be said about being apart of such a process. I can’t express with words how much I enjoyed being outdoors in a serene atmosphere, knowing what was in the ground that day will be in the hands of local families that afternoon. After my time on the farm, this reinvigorated me to continue my goal of using “in season” ingredients in my recipes. With that said, I knew I wanted to do something with asparagus then I started fantasizing about the photo shoot. Nothing says Spring like yellow and white. 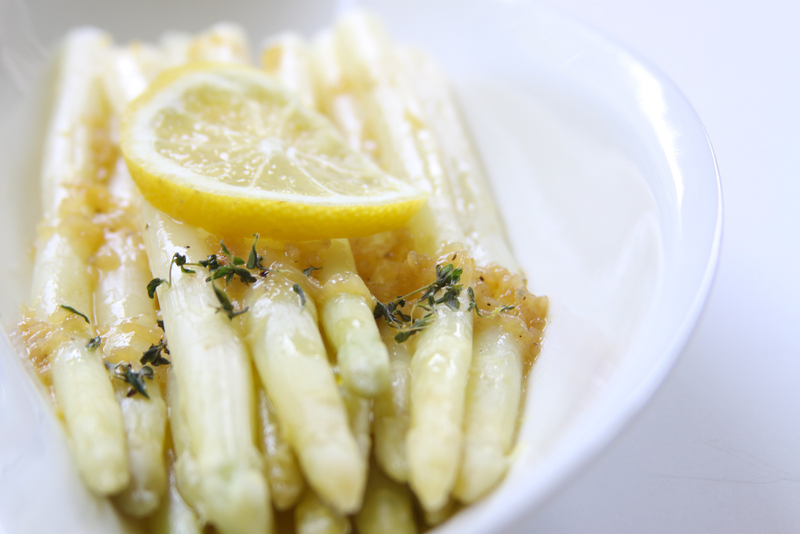 I translated this color scheme to white asparagus with a lemon reduction. That my friends is how this recipe transpired and a tiny peek into my brain. Using a wide, deep pan bring enough salted water to cover asparagus to boil. Add asparagus and boil for 5 minutes. Dunk asparagus in an ice bath, dump out boiling water and place asparagus back in the same pan. Using a small saute pan, heat olive oil at medium-high temp. Saute for 1 minute, shaking pan. Be careful not to burn the minced shallot. Remove pan from flame and turn away from stove, add wine. Place pan back on burner and add lemon juice and lemon zest. Shake saute pan violently and continue to cook until reduced by half. Add a pinch of sea salt and a couple twists from a pepper grinder. Add butter and continue to shake saute pan until butter is melted and sauce is shiny. 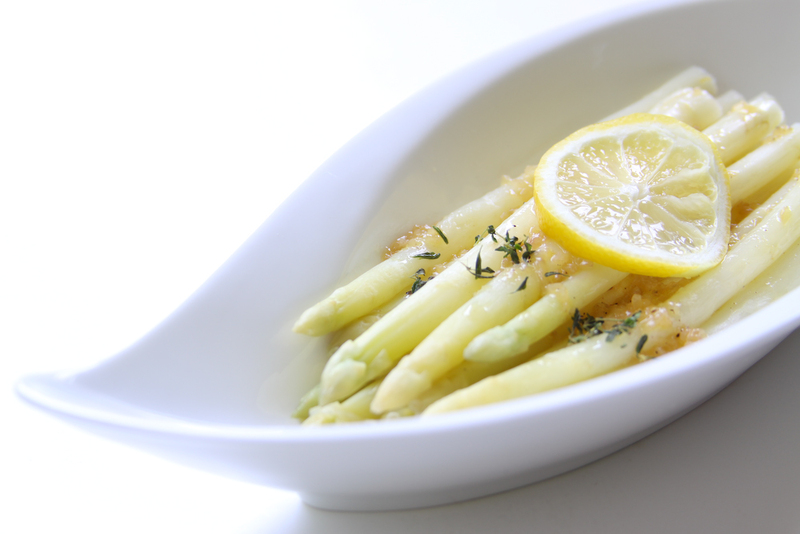 Drizzle sauce over asparagus and garnish with lemon thyme. Trick of the trade: Where do you cut off the ends of the asparagus? Take one stalk and towards the end gently break in half, it will break towards the end of the stalk. This is an indication where you should cut the other stalks. Dunking asparagus or any other vegetable in an ice bath (a bowl with water and ice) stops the cooking process. If you skip this step, once you are done making your sauce your asparagus will be overcooked. When deglazing (adding wine to sauteed minced shallot) you must be careful. I ask that you turn away from the open flame to avoid a potential fire. Shaking the saute pan violently helps your sauce form and not “break” as they say in the culinary world. And, when I say violently I mean pretty damn hard. Enjoy! From my kitchen to yours. Subscribe to Z is for zest and have recipes delivered to your inbox.